In the Bruhn household, that mash-up of customs comes together for what’s essentially a monthlong celebration. 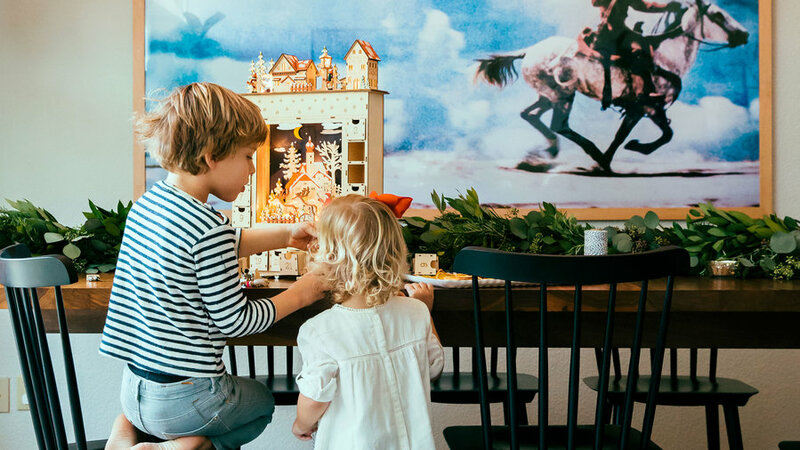 Much of the holiday season revolves around a wooden Advent calendar. As the kids open each of its drawers, they discover a note from their parents revealing the day’s activity. “It’s our holiday wish list: See Santa, bake cookies, have friends over, watch The Polar Express,” say Ashley. 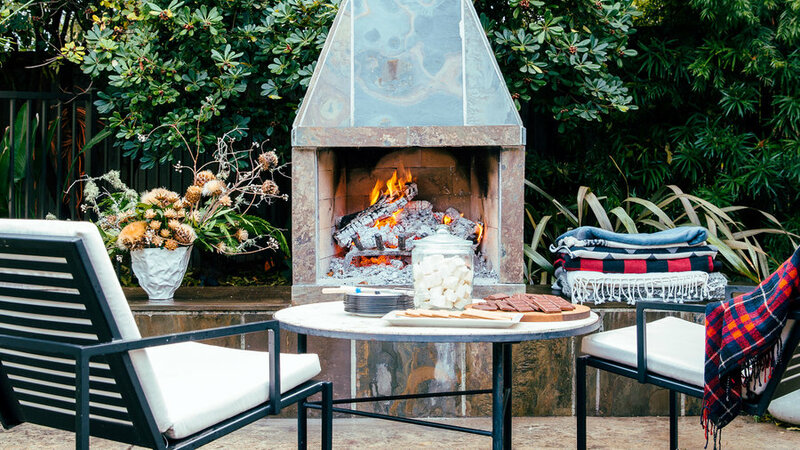 The Bruhns trade off holiday entertaining with friends: They invite families for s’mores in their backyard, another couple hosts an adults-only cocktail party, while a third family takes charge of a cookie-decorating get-together. Some notes the couple tuck into the drawers of their German-style Advent calendar serve as reminders for big events—the town’s Christmas parade, say—but the schedule isn’t set in stone. “Sometimes we cheat,” Ashley says. “If we’re totally exhausted, we might switch out ‘Decorate the tree tonight’ for ‘Eat a candy cane.’ ” (similar), $68. , $279 each. , from $2,399. , $129. , Untitled (After Richard Prince) by John Stanley. 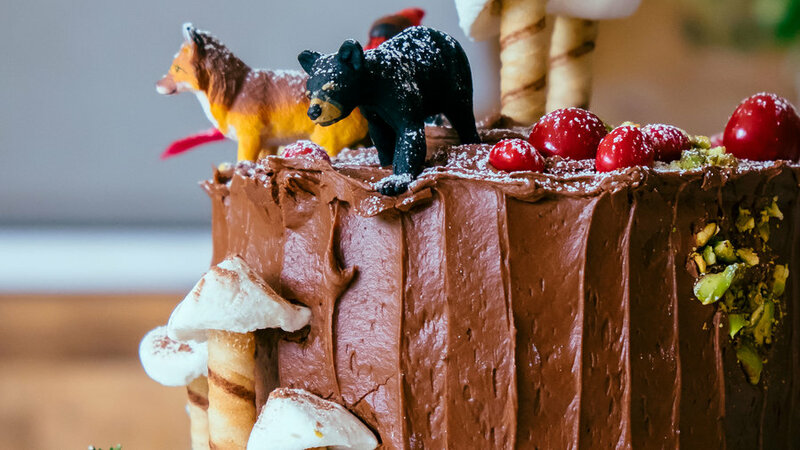 After a few years of experimenting with the classic French bûche de Noël (aka Yule log cake), Ashley came up with a : a stump rather than a rolled cake. 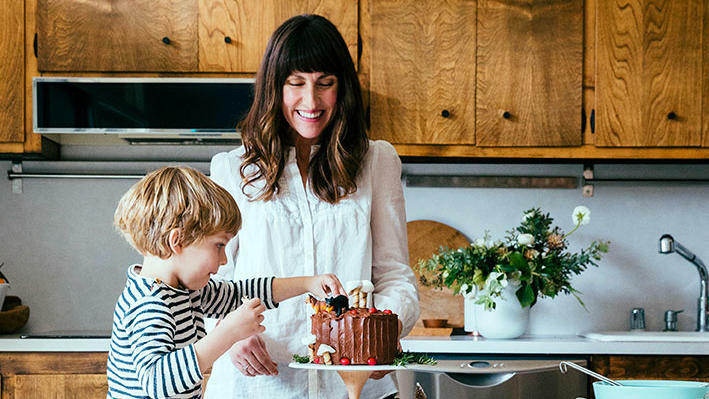 “It’s easier—and often, I daresay, prettier—leaving us more time for decorating,” she says. She lets the kids festoon the cake with plastic figurines, marshmallows, rosemary, and more. 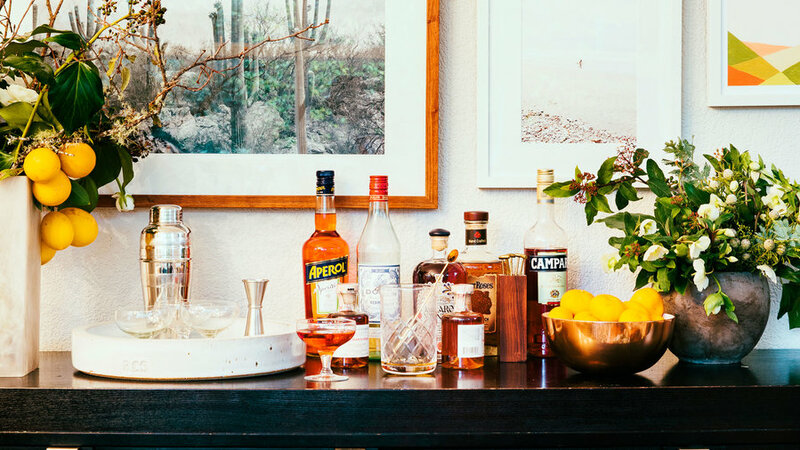 During the season, the couple stay ready for impromptu parties, keeping a sideboard stocked with whiskey and amaro. In true West Coast style, they fill vases with Meyer lemons on the branch. 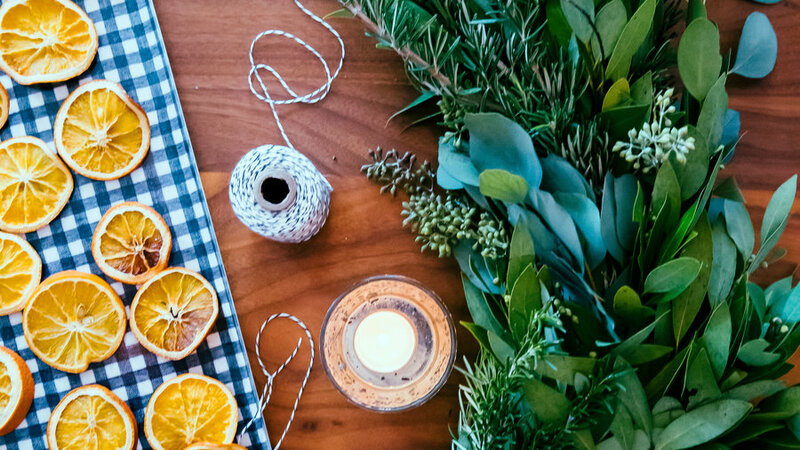 Ashley layers a garland made of California bay, eucalyptus, and rosemary on top of their dining room table. The Bruhns also pluck blood oranges from their backyard tree, turning them into ornaments by baking them for about four hours in a 150° oven and adding a loop of string. 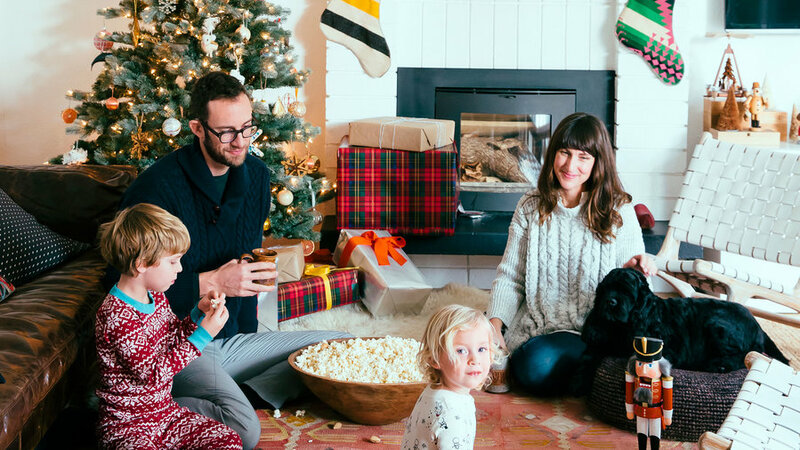 The family’s living room has a simple but festive style: a sculptural wreath by florist Natalie Bowen; a tree done in gold and white (plus the kids’ handmade ornaments); Aron’s childhood sheepskin rug; and a nutcracker Hudson asked for last year. The clan chose stockings from an Alameda Point Antiques Faire vendor who makes them out of vintage Pendleton blankets.